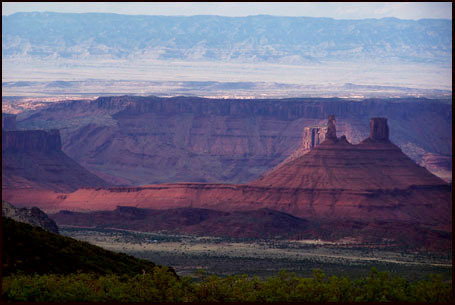 Moab mountain bikers have the White Rim Trail, and they even have the "whole Enchilada" route. But the road bikers have the La Sal Loop Road - a sort of Green Rim Trail. It climbs up above the canyons of the La Sal Mountains and makes its way over a juniper covered slope below the bare peaks of the mountains. Once you can take your eyes off the stunning view of Fisher Towers at the summit, you notice that a single track trail crosses the road here. This is part of the Porcupine Rim Trail, which is part of the Kokopelli Trail route, and going uphill, the route is called "the Hazard County Trail" - no idea where this name comes from, I just hope it's not some stupid TV show. But this brings us back to the "whole Enchilada", the Hazard Trail is part of it, and it reaches from Geyser Pass over a high pass in the La Sal Mountains all the way down to the Colorado River in Moab. Yet another largely different way to reach this point, is via the Sandflats dirt road. It joins the southern approach of the first profile 2 miles before the summit. In terms of the Kokopelli trail ( referencing the Cobmoba description 1996, revision 3 ) this summit is located at mile point 124 of the trail. The Kokopelli route follows route follows the paved approach between points 7 and 8. 8. (6490ft,mile26) La Sal Loop road joins road to Castleton. Kokopelli Trail goes back uphill to right, while profile continues down valley to Castleton. Southern Approach: It may not look like it, but Spanish Valley Road, paralleling Ut191, leaving Moab towards the south, already climbs quite a bit. This road has much less traffic than the main road, and I wouldn't want to miss the VW junk yard dealer on the side road. I don't think I have ever seen that many VW buses in one place. The profile starts a little later, near Kens Lake, which is also a signed turnoff from Ut191. "No camping signs" line the road like trees in wetter climates for the first miles. The climb starts in hearnes past the Pack Creek road turnoff. A switchback leads you to the top of a ridge, with a great vista onto South Mountain, Mount Tukuhnikivatz, and La Sal Pass separating them. A view of pieces of road, slanting up through the junipers, gives a good idea of what is ahead. It seems to get progressively steeper. The first top is reached just past the Geyser Pass (dirt) road turnoff. A view to the opposite side shows that we are indeed on a broad shelf. Mill Creek Canyon is below a sheer thick piece of caprock. The road crosses the upper part of this little stream at a low point and then climbs up to Jimmy Keen Flats. The second summit is now easily reached. A transmission facility reiterates that we are approaching a strategically high point, and when Fisher Tower comes into view at the end of a long straight away, it is a great moment. Northern Approach (described downwards). This descent is one of Utah's great scenic transitions, from the bare peaks above, down into the red rock troughs below. After an initial straight away to build up speed, a set of switchbacks give the road an alpine character. The traverse between this alpine world and the canyons below make these miles some of my favorite Utah paved cycling, when you still have the company of the peaks above, and only suspect the depth of the canyons below. Further down the road passes an burned area, which adds another ghostly element to the already improbably landscape. Here the La Sal Loop road joins the Castleton Valley road. The route uphill to the right is described in the Kokopelli Trail summit(u): m114. The linear landscape of the Porcupine Rim give the valley a large bowling alley character, and the road heads straight down into it, at a grade that doesn't require really any braking or pedaling. To the right a needle, that is a famous rock climbing goal can't be missed. Approaching the bottom a small but steep uphill reminds the cyclist that he is still human and that he has to pedal hard going uphill. This large dreamlike downhill is almost over. The profile below replaces most of the southern approach above with the Sand Flats road, a good dirt road that can shorten a loop ride over the summit, even though the profiled sections is actually slightly longer. 02. (5840ft,mile09) Kokopelli Trail, here also called Porcupine Rim Trail leaves Sandlfats Road on left. But profile continues straight on Sandflats road. 03. (7362ft,mile18) trail on left leads to Porcupine Rim. Profile continues right. 04. (7880ft,mile20) Sandlfats road joins paved La Sal Loop road. Continue left. 06. (6490ft,mile28) La Sal Loop road joins road to Castleton. Kokopelli Trail goes back uphill to right, while profile continues down valley to Castleton. From West. From Moab the route on Sandflats road leads past the slickrock bike trail area. What was once an impromptu camping area is now an organized fee campground, complete with toll booth, where an amazing variety of bikes can be seen mounted high on rooftop racks before going into slickrock action. The route described here constitutes a different kind of cycling. No technical expertise is required, just a little stamina, and possibly resistance to heat exhaustion. The road makes its way gently and smoothly between sandstone fins to the junction with the Porcupine Rim trail. The quickest way to the summit is longer of the two. It continues on the Sandflats road, which is intermittently paved along the steeper sections. Then the road flattens out to contour along the plateau and draw closer to the La Sal peaks. 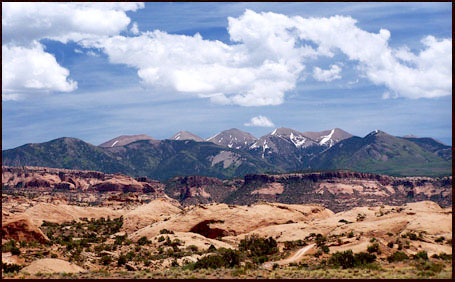 The route turns left on the La Sal loop road, which is paved and leads to the summit in an almost straight line. Here the Porcupine Rim trail rejoins the loop road. The summit is a shoulder from where the first views of Castleton Valley appear. From East. Same as "from north" above. Pictures: top and third: evening thunderstorm above La Salle Pass area, as seen from lower southern approach. Goup of two: left: Looking back on the drop between points 3 and 4. right: drainage ditch in Libby Flats area. Imediately above: La Salle Peaks seen from Sandflats road approach. Immediately below: telophoto view north from summit. La Sal Loop Road s(u): Co128 east of Moab > Moab several circles around Moab > up Sandflats Road > La Sal Loop Road s(u) > down Castleton Valley > back to starting point: 65 miles with 5700 feet of climbing in 6 hours, on a very hot day (m3:6.5.24). same summit: southern end of La Sal Loop Road > La Sal Loop Road s(u) > Castle Valley > Co128 north > Moab > several loops around Moab > Spanish Valley Road south > back to starting point: 66.2miles with 5080ft of climbing in 5:26hours (Vetta 100A r2:11.10.2).